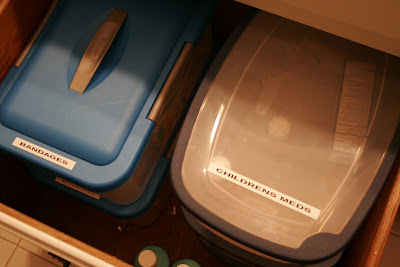 Around the time I worked on my pantry, I also tackled the "medicine drawer" in our guest bathroom. Whenever one of us was sick, it was difficult to find what we were looking for, especially if we just needed a decongestant in the middle of the night. SO, I decided to hop on the Organizational Train one more time and take a stab at it. And that's not all I had! I also had bandages stuffed in a sack under one of the sinks, which made them easy to grab when we had an emergent skinned knee or papercut. My first step (after throwing out all of the expired medicine), was to grab my trusty labelmaker. Next, I made a mental list of the categories I needed to assign. Then I started printing out my labels. 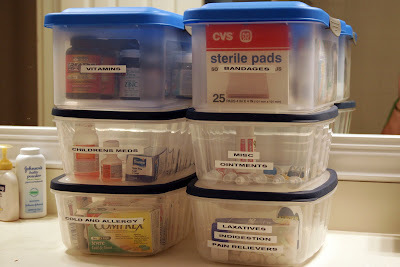 Then I started grouping all of the medicines and bandages so they could be tucked into their containers. Before long, I had a nice stack of containers ready to put back in the drawer. And if you thought that we didn't have medications for as many ailments as they have in an ACTUAL DRUGSTORE, you'd be wrong. And although I'm partial to Band-Aid brand bandages, I don't discriminate. I have a little of everything on hand. 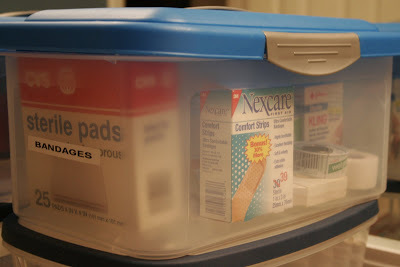 For the record, Nexcare bandages have EXCELLENT adhesive properties and will stay on for at least five handwashes. I know this because I'm an obsessive handwasher. And, voila! My new-and-improved medicine drawer! Very exciting (for me). Oh, and also for the record, Grayson's cousin Iva (Hi, Iva!) has informed me that the Rubbermaid containers I put my pantry items in might be leeching Harmful Plasticky Thingies into my dry goods. So I might be switching back. I tell you this in the interest of full disclosure. But I'm pretty sure the rays aren't working their way into my Band-Aids, so I think I'm OK in the bathroom. "Misc Ointments" is pretty hilarious. "Ointments" is such a silly word. Ointments. Ointments. It's not even one of those words that becomes weirder if you repeat it...it's already weird the first time. You're right. And when you're printing labels out, it looks even more strange. Also, I hate the word "weird," because it doesn't adhere to the "i before e rule." I try to avoid typing it if I can. Nexcare is much better than Band-Aid because the sticky part goes completely around the gauge. It can better seal the wound so it is more sterile. I am surprised Katherine hasn't noticed that yet.